Considered an afterthought when he was signed as a free agent out of Cal in 1987, Keith Kartz went on to start 7 seasons in the NFL for the Denver Broncos primarily at Center and also at Tackle. 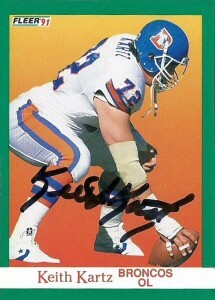 Originally signed by Seattle and cut in camp, Kartz quickly asserted himself at the Bronco’s starting Center when he was brought in during the ’87 player’s strike. Kartz’s feat is even more impressive in the fact that he’d never played the position at all during his time in college, but to top that all off was Keith was a survivor- beating Stomach Cancer when he was only 18 years old. 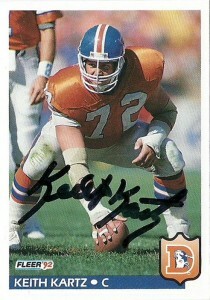 Keith’s versatility and size (6’4″, 270) allowed him to effortlessly spend time at any position along the line as evidenced in his extensive tour of duty in 1988 at right guard protecting John Elway. By 1989 he was back at center clearing lanes for a slew of 1,000 yard backs that included Bobby Humphrey and Gaston Green. Keith flew under the radar for the majority of his career with the Broncos, and had a strange sideline penchant for balancing and twirling footballs on his fingertips. The stranger thing about it was that both Topps and Upper Deck both immortalized these sideline shots of him in two different photographs for their cards. He’d retire after the 1993 season and worked with the Denver Crush of the Arena leagues as an assistant coach before falling back into real estate.